Proceeds to benefit grassroots hockey organizations participating in G&D 15th anniversary tour. 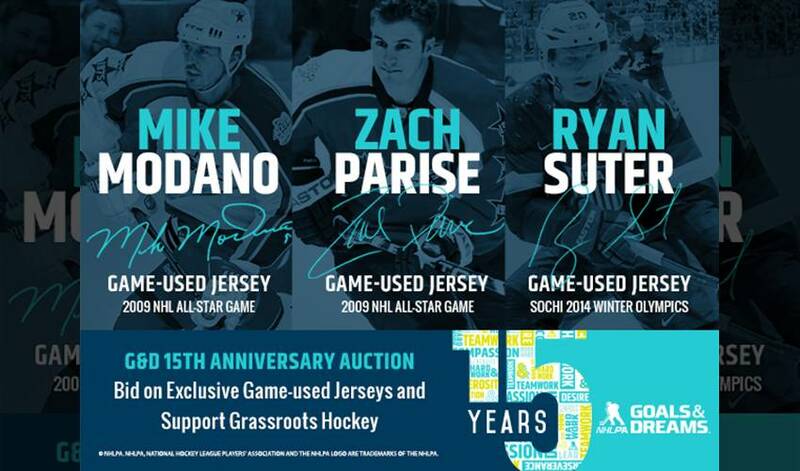 TORONTO, ON (November 24, 2014) – As part of the National Hockey League Players’ Association (NHLPA) Goals & Dreams (G&D) fund’s 15th anniversary celebrations, G&D is holding an online auction that consists of 15 jerseys game-worn by current and former NHLPA members, with the first phase of the auction now open. Bidding for the 15 jerseys in the online auction will run in phases, with three jerseys to coincide with each city / event on the G&D 15th anniversary multi-city tour: one All-Star jersey and one 2014 Olympic men’s hockey jersey – both of current players; and one jersey of a superstar player who formerly played in the respective city. Proceeds raised during the online auction will be donated back by G&D to the grassroots hockey programs involved with the tour. To celebrate 15 years of helping children worldwide play the game of hockey, G&D is conducting a multi-city tour that started last week in Hastings, MN with children from Defending The Blue Line and Hastings Minor Hockey. Throughout the season, G&D will continue its regular giving cycle by donating a projected $750,000 worth of brand new hockey equipment to grassroots programs around the world, totaling more than $22-million in donations that have helped 70,000 children play hockey over the last 15 years.